While inbounds plays can seem inconsequential at times in the grand scheme of things, there’s no denying the fact that a well executed a inbounds play will more often than not produce a high quality shot. And if you have 10 inbounds opportunities a game, in a tightly matched contest, that could mean an additional 10+ points and the difference between a tough loss and a great win. That’s why it’s a good idea to set aside a chunk of time each practice to working on inbounds plays. This is especially true because often times players will need to know multiple plays from multiple positions, often resulting in miscues that could cost your team over the course of a game and ultimately, your season. The point guard will inbound, with both bigs on the strong side and our wings on the weak side. The first action once the play has started is the two coming across the key to set a back screen for the power forward. The center will drift out to the short corner and the small forward out to the top of the arc, where he will remain as safety. Our first option of course is the power forward coming off the back screen to the weak side block, but if that isn’t there, our center will next come and set a back screen of his own on for the two guard. The two guard will cut off the pick out to the corner, looking to spot up for the three point shot – this is our second option. And our third and final option will be our center slipping to the hoop after setting the screen, looking to catch the defense over pursuing out to the three point line. 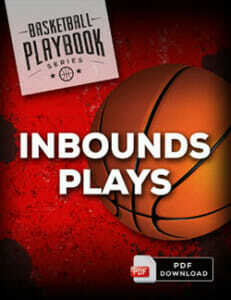 The Inbounds Plays playbook is jam-packed with 32 proven plays to help your team get more easy baskets. You’ll discover plays from the sideline and baseline that work for all ages and competitive levels. Each one is broken down with step by step details and illustrations, showing you detailed responsibilities for each position, primary, secondary and “release” options, and critical coaching tips to improve execution. Next step: check out our complete library of free basketball plays. Or download one of our basketball playbooks in PDF format. That final 5 – 4 screen can be a flex screen with the posts reading the defense as one of them cuts low and the other pops high and 3 Moves to weak side wing . Pass to low post = shot. Pass high = score, dump or reverse to 3. 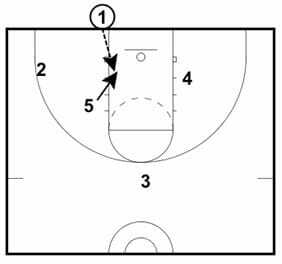 On reverse, low back screens high. 3 now hits 1) has an isolated 2) can hit high cutting low off backscreen or 3) hits new high post who again has shot, drive, or dump. I think it would work for a zone. After the initial 2 picking the 4, just have the 5 set a pick on the bottom outside zone player, then continue it to screen the inside zone player, then you can have either the 4 or the 3 cut to the ball side block. Good motion, from basic sets and simple assignments. I assume the start positions are flexible. For instance, I think it makes more sense for our team to switch 4 and 5 and 1 and 3. This way our scoring center (5) is the first option, the 3 is bigger to inbound, and the point (1) is at top to set up offense if play doesn’t produce a shot. Teach from both sides, and even same play with players starting in diff spots and may be good enough to run primarily and keep youth team confused. I find after running a play 3 times the opposing coach starts yelling “Cody, watch 23 after screen!”. So, mixing up after your team can grasp the 3 options would be great. Thanks, we’re installing next practice! 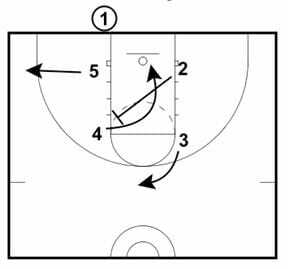 On the option of hitting # 5 on the roll after setting screen for #2, if he is not open then he can take his defensive man across the lane and set screen for #4. I think this makes it work vs zone. It should be very effective. I would have the 2-man screen the center instead of coming all the way up to screen the guard. With the 5 flashing to the corner, hopefully that will pull the ball side forward with him. You could even change the angle of the 2-man’s screen to make it more effective and put the defensive forward in a bind over who he covers. If your 5 can hit a 3, even better. In the second panel I would have the 5 man screen the guard, making the defensive forward responsible for 2. When 5 cuts to the block you have the center stuck between taking him or the 4. Against a zone I would slide the 3 man from the top of the key to the opposite corner, putting the weakside forward in a bind over who to cover, 4 or 3. I can see this creating serious match up decision problems for a zone. Sorry if this is too wordy. Yes it should work just fine against a zone. Most youth teams will play a sloppy zone on an under the basket inbound play. I already use the first and second options, so I am anxious to add the third and fourth options. It will add a new look to a play opponents are prepared for. Thanks! 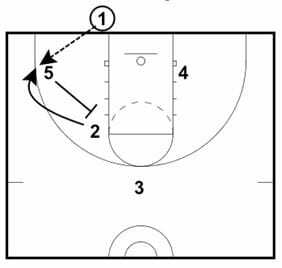 Since a zone covers a certain area on the floor this play will not work well. You would need more screens around the basket in order for this to work against a zone. This may work against a M2M at the youth level.